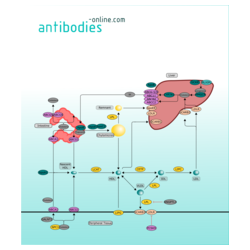 To utilize lipids available from food, adipose tissue or synthesis by the liver, a complex transport system for lipids, primarily in the form of triglycerides has been established. Lipoproteins enable cells to transport hydrophobic lipid molecules via the aqueous blood and tissue lymph environment. Lipoprotein particles are defined by their complement of associated apolipoproteins (Apo) and their content of cholesterol (CHOL), triglyceride (TG) and phospholipid that each particle carries. Specific apolipoprotein constituents control the lipoprotein metabolism and are involved in the transport and redistribution of lipids among various cells and tissues. Lipoproteins have been grouped into four major classes: high density lipoprotein (HDL), low density lipoprotein (LDL), very low density lipoprotein (VLDL), and chylomicrons1. First step to form HDL is the transfer of cholesterol and phospholipids onto apolipoproteinA-1 (ApoA-1) to generate nascent HDL. NPC1 is responsible for the intracellular transport of cholesterol, the transfer to HDL is catalysed by the ATP-binding cassette (ABC) A1 (ABCA1) transporter 2. ABCG1, another ABC transporter, is able to load more cholesterol onto HDL from peripheral tissues as well as intestines (dietary cholesterol) which is then esterified by Lysolecithin cholesterol acyltransferase (LCAT) in order to generate the mature HDL3. HDL cholesterol-esters are taken up by scavenger receptor SCARB1 in liver and after hydrolysis the resulting free cholesterol is metabolized to bile acids (BA). The bile acids are excreted into the digestive tract in a process that again utilizes ABC transporters (ABCG5/ABCG8, ABC11, ABCB4 and ABCC2). In the small intestine absorbed dietary fatty acids are converted into TGs and together with ApoB, ApoE and ApoC2 subsequently packaged and secreted into the bloodstream as chylomicrons. Lipoprotein lipase (LPL) hydrolizes the TG, and chylomicron remnants emerge, which are taken up by the liver via the apoE receptor (ApoER). Cholesterol ester from HDL are also transferred to VLDL remnant particles (IDL) via the cholesteryl ester transfer protein (CETP)4. IDL on the other hand loses the majority of apolipoprotein and is converted to LDL by the action of hepatic lipase (LIPC). This converts IDL into LDL, which is taken up by cells that require cholesterol for incorporation into their cell membranes or for synthetic purposes (e.g. the formation of the steroid hormones). The remainder of the LDLs is removed by the liver. Uptake is mediated by SCARB3 (also known as CD36) and LDL receptor (LDLR) in both cases. 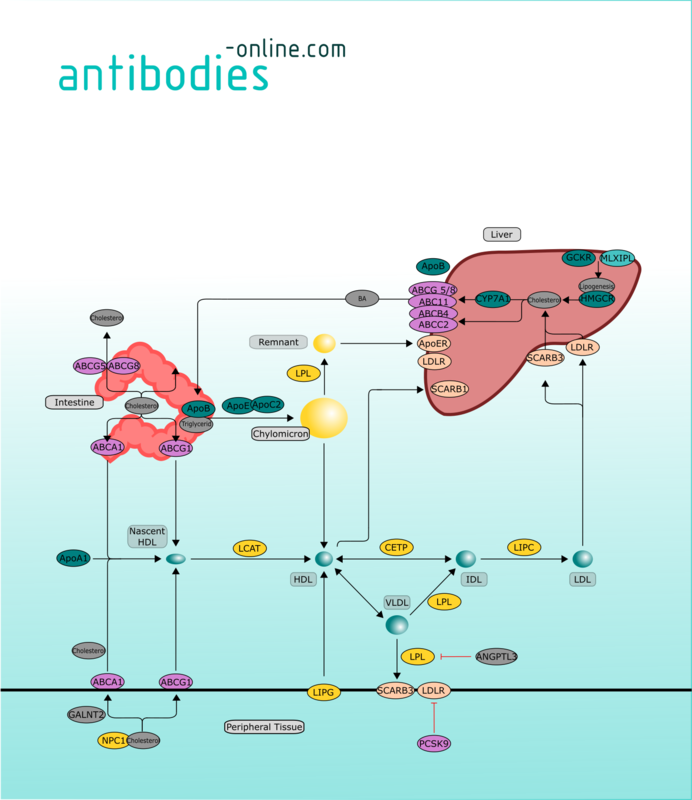 Proprotein convertase subtilisin/kexin type 9 (PCSK9) can bind and inhibit the LDLR.